Black Tuesday is upon us, and the market will crash today. The Great Recession – Phase 2 is thundering down upon us. All along, the only indicator that has made any sense is the US Department of Labor’s advance figure for seasonally adjusted initial claims. This is the US Department of Labor’s estimate of unemployment claims over a 4-week period. Yes, unemployment claims are down from the 540,925 initial claims in the comparable week in 2009. However, since 75% of the US economy is consumer-driven, with close to 500,000 layoffs during each 4-week period. How can there be any evidence of a turnaround? There can’t. 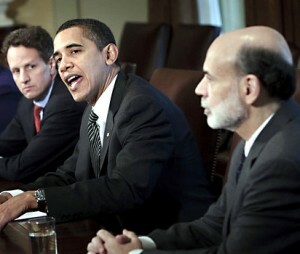 Obama with his Bernankes and Geithners have been spreading the word of an economic turnaround. Strange to be commenting on my own post, but it looks like the big boys came in again to support the US stock market. Since the volume is low, that is not too difficult. Let’s see just how long the big boys can keep their finger in the dike and keep the floodgates from opening.